I recently received this nice FDC from USA and decided to share it with you as it gives me the opportunity to come back on a stamp set that I really like. 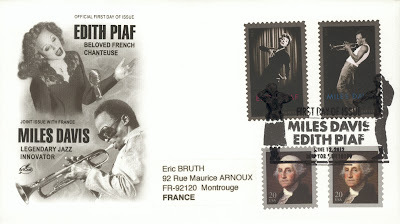 As you can see this is a First Day Cover for the two stamps issued jointly between France and USA to celebrate the shared cultural history between both countries. 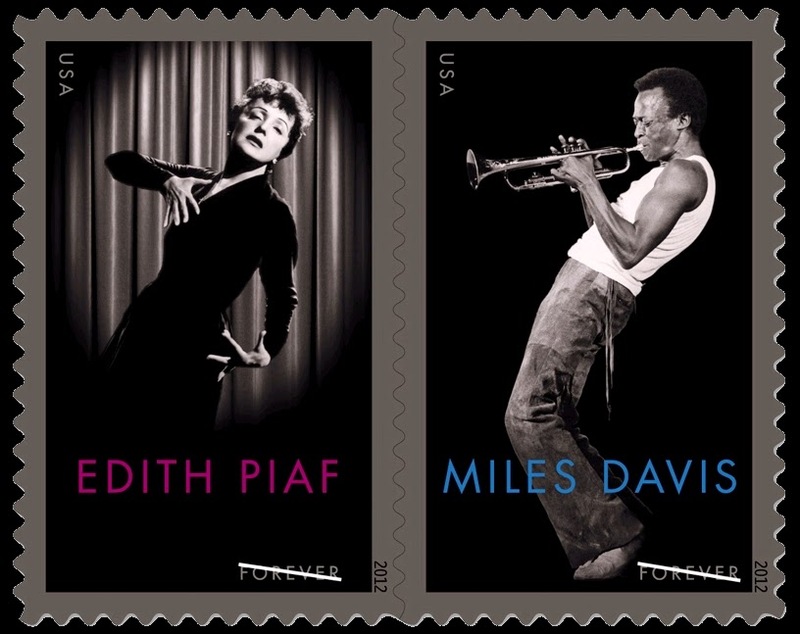 The stamp pictures two legends that I don’t need to present: Miles Davis and Edith Piaf. The choice of both artists is not an accident. 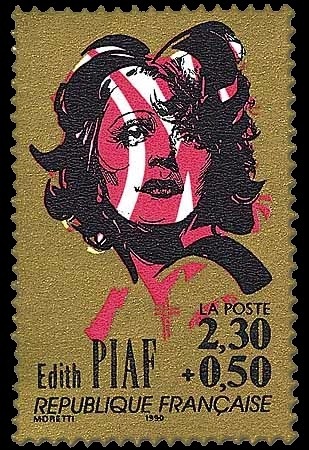 Edith Piaf is one of the very few (very very few) French singers who became famous in the USA. 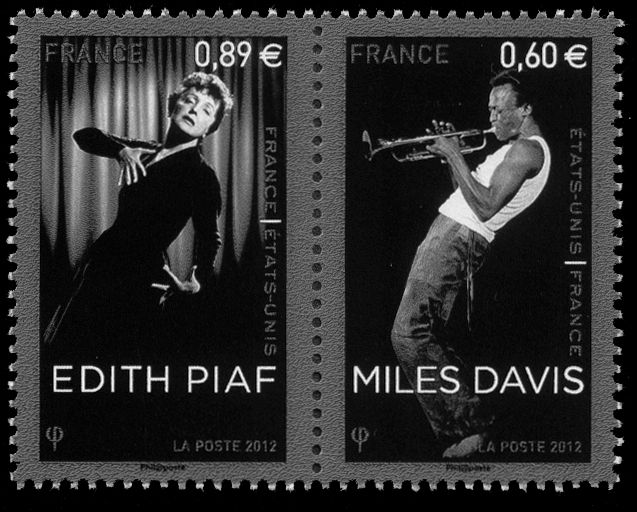 Miles Davis is beloved in France where he performed frequently. He was even made a Chevalier in the Legion of Honor, a very important distinction in France. I really like those stamps. You may have a better view on this scan coming from the USPS website. 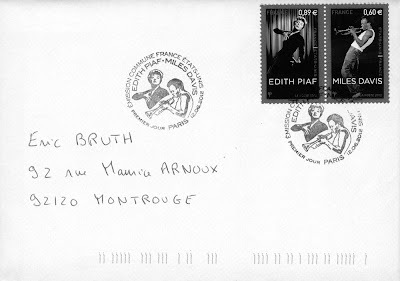 I already wrote about this issue in a previous post where I showed the stamps issued also by France and a FDC that I sent to myself. Both countries have adopted exactly the same design for the stamps, nevertheless there are some differences. The names of the artists are written in color on the stamps from the USA while it is in black & white on the French stamps. I must say that I prefer the choice of French postal administration as it goes very well with the rest of the stamp. Two other differences to be noted: the USA stamps are “forever” stamps, meaning they don’t have a specific face value but they are valid “forever” for postage at the standard rate within the USA. The French stamps bear face values: the standard letter rate within France for the stamp picturing Miles Davis and the standard rate for a letter to the USA for the stamp picturing Edith Piaf. Also the French stamps are gummed stamps while the stamps from USA are self-adhesive. Another difference: the American stamps are sold in the form of a sheet of twenty stamps (ten of each). On the back of the sheet there is a QR code, that once scanned with your smart phone, leads you to a website full of information about both artists. See below the back of the sheet. As you can see also on the FDC, the two postal administrations have made very different choices for the first day cancel. I like the one from USA but I think it gives disappointing results with the black silhouettes on the black background of the stamps. I read an interview from Greg Breeding, the creator of the stamps, that was very interesting. He explained that he started going though a lot of pictures from Miles Davis first and he was struck by the way Miles Davis often leaned back while playing the trumpet. Then going through pictures of Edith Piaf he realized how she used her body and hands to express her voice. He finally selected the two pictures of the stamps on which Edith Piaf and Miles Davis share a diagonal position that gives a very attractive symmetry to the stamps. This is not the first time that Edith Piaf appears on a French stamp. She was already the subject of a stamp issued in 1990. 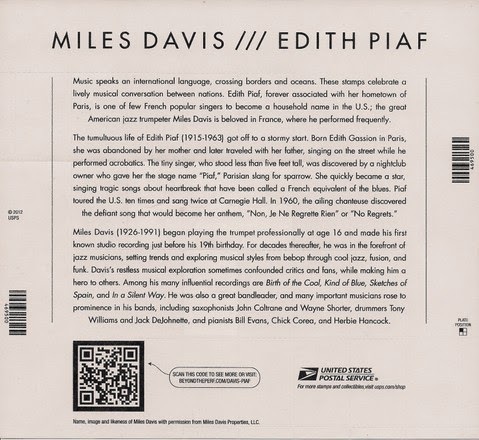 No French stamp so far had been issued picturing Miles Davis, and this is the first time, I think, that both artists appear on the stamp from the USA. This joint issue between France and USA is the fourth one. The first one was in 1983 with a common issue to celebrate the US bicentennial (each postal administration issued one stamp with a different design). The second one was in 1986 to celebrate the 100th anniversary of the Statue of Liberty (each countries issued a stamp with the same design). And the last one was in 1989 to celebrate the bicentenary of the French Revolution (USA issues one stamp and France issued a se-tenant set of three stamps).